For lovers of rock music, in its raw, throaty and earthquake-inducing prime, the new album by three true exponents of the art is a revelation. QSP will excite, rumble and erupt long-thought-dead emotions of past memories. The personnel are a remarkable combination. Suzi Quatro is a figurehead for female rock music, but she’s so much more. Her vocal and bass drive is infectious and consuming. Andy Scott is a revelation. I never realised how steeped and clinically exact he is as a professional music man: his Sweet days are a long way away and this new, never heard before Andy Scott strides Collosus-like. Don Powell, is and has been since the 60s, a force of power and admiration in drumming circles. When I first met him in December 1970, just before Slade went stratospheric, he said that he was getting a bigger, better and louder drum kit. He did, and he’s still thundering out a magnificent controlling beat. QSP is a change in direction, but Don is a musicians’ musician and he adapts his style to suit. This trio relies on each other individually and stylistically, and the result is a great album. Slow Down: First track and straight into Jerry Lee Lewis-style 50s RnR. Sax and keyboards drive it forward, with Don powering away. 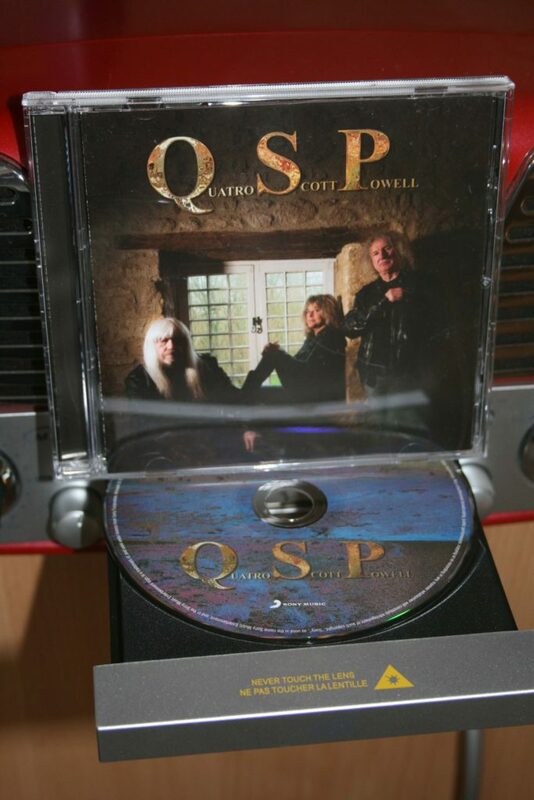 Long Way From Home: Andy Scott and Suzi wrote this and their vocals are top drawer. Simple cadence can be a little metronomic, but the poignancy of the title is given full rein. Over the six minutes there is a crescendo building to allow Scott’s guitar full rein, before the rhythm kicks back in. Tobacco Road: Make that geetar wail Andy, and thump out the power beat, Don. Suzi and Andy will grab the well-known lyrics by the throat and sing out loud. Suzi’s bass takes control on a well-disciplined track. Jez Davies, guesting on keyboards again, is a joy. If Only: Don crashes the intro; Andy picks up the lead; and Suzi’s voice soars over them. Another Quatro track and, as is natural, her bass takes a central role, but behind her Don keeps it tight ‘as a drum’ and Andy drives the melody along. Another poignant collection of lyrics from Suzi, which her strong, distinctive voice communicates, despite the drive of guitar and drums. Bright Lights, Big City: Don Powell in complete control: he takes up the melody from the start and Suzi thumps that bass line in a gut-wrenching, joyous and solid four-bar, while she and Andy can be ‘seen’ smiling through the lyrics. They know they’ve got something special here. Pain: ‘Power up the Quattro’ was DCI Gene Hunt’s catch phrase in Ashes to Ashes. This 80s-style orchestral track is penned by Suzi Quatro and Andy Scott has all the atmosphere of those dramatic times. She pleads and she fights and you just know she’s going overcome this particular emotional pain. Strings arranged by Mike Batt … now there’s a pleasant surprise. Just Like A Woman: Many have tried to get Bob Dylan’s emotions across; QSP have managed it. Suzi’s voice captures every nuance, and roars over the drive of Don and Andy. If you’re going to sing a song by a master lyricist and poet, you’d better be good. Suzi Quatro is that good: Dylan will appreciate this treatment. Mend A Broken Heart: Andy Scott in 4/4 jazz mood with a dated vocal style that suits the discipline of Don’s drumming and Suzi’s bass. For once Suzi’s vocals take a back seat, but they’re still exactly what’s need to emphasis Andy’s clarity. Keyboards and sax could be late night jazz session, but with this power there’s no nightclub sleaze. The Price Of Love: I’m not sure the Everley Brothers intended this to be such a rocker, but there’s no argument with three musicians at the top of their game. The vocals are great, but just behind them Don’s drums hammer out a solid foundation to keep everything on track. Broken Pieces Suite: Is that St Winifred’s Choir I hear? No, it’s a great, self-penned vehicle for Suzi’s story-telling vocals combining a gentle rhythm with absolute clarity, before Andy and Don crash in and drive it into a fighting-talk rocker. It’s almost operatic. I Walk On Gilded Splinters: Don Powell is a world class drummer, and that’s a fact. Intermittent guitar strokes give way to dual vocals – almost a duel – and then an echoing guitar riff, while the drum beat never falters. A galloping drum riff brings in Andy’s wailing guitar and Suzi’s bass keeps it solid. There’s a hint of a rocking Tubular Bells in the background. Late Nights, Early Flights: The two guitarists, Suzi and Andy, are back at it. They’ve written a driving rock ‘n roller that has a very heavy, drum-base rhythm and the lyrics are all about what they know best – the time-defying world of being global rock stars. Little Sister: Pop music with a Suzi Quatro voice. She takes this great little track in her beautifully manipulative hands and fashions a vehicle for everything that’s good about her voice and bass guitar. Oh yes, Suzi owns this number. Pain (the band): Suzi winds up the album with some powerful, crying and demonstrably constructive vocals. No orchestra with strings: this is measured, emotional rock. Yes Suzi, “we’ve all gotta feel pain sometimes”, but not when you’re singing back by two great musicians. In the early 70s I nailed my colours to the mast of Slade and for a while they were the biggest band in the world. The also-rans of Sweet and Mud, and, to an extent, Mark Bolan, were just that. Wind forward 44 years and Sweet’s Andy Scott is a stand-out musical star. He’s a guitarist, a vocalist, a song writer and he deserves some big bouquets for producing this remarkable album.